I wrote a review for BlueSheepdog.com of the new LAPD-approved Smith & Wesson Bodyguard 380 pistol in September of last year. I thought I would give you an update as to my continuing experience with the gun. This being Florida, I would say that firearm choices for concealed carry are sometimes dictated by the hot weather clothing. For many of us, it is difficult to conceal even a medium-sized pistol or revolver when the temperatures soar into the high 90’s with the oppressive humidity. Shorts and a t-shirt only help with the heat a little. The Smith & Wesson Bodyguard 380, which was officially approved for on duty back-up and off-duty carry by the Los Angeles Police Department, has been a good concealed carry weapon for me here in the “Tropical” South. Though its length, height, thickness, and weight are slightly greater than my Kel-Tec P3AT, the added features of the Bodyguard 380 make it worth toting the smidgen in increased size. The hammer-fired second strike capability, adjustable sights, loaded chamber indicator, slide stop lever, and slide lock after-the-last-round all contribute to the Bodyguard 380’s defensive usefulness. Since September, I have jogged numerous times with the Bodyguard in a Pistol Wear PT-2 holster, which is worn under a t-shirt. The gun weighs a scant 11.85 ounces unloaded, so even with the magazine and 7 total rounds, the Bodyguard stays put and does not jump around while I am running. I am very attached to my Pistol Wear PT-2. It carries a small gun very close to the body, much like a belly-band, however, the waist strap is less cumbersome. The PT-2 also blocks moisture because the gun’s pouch is solvent and perspiration resistant from the back. The second carry method for which I feel the Bodyguard 380 ideal is pocket carry. The pistol fits snugly in an Uncle Mike’s size 2 holster. In my right front pocket, the gun and holster combo resembles a wallet or maybe a smartphone. 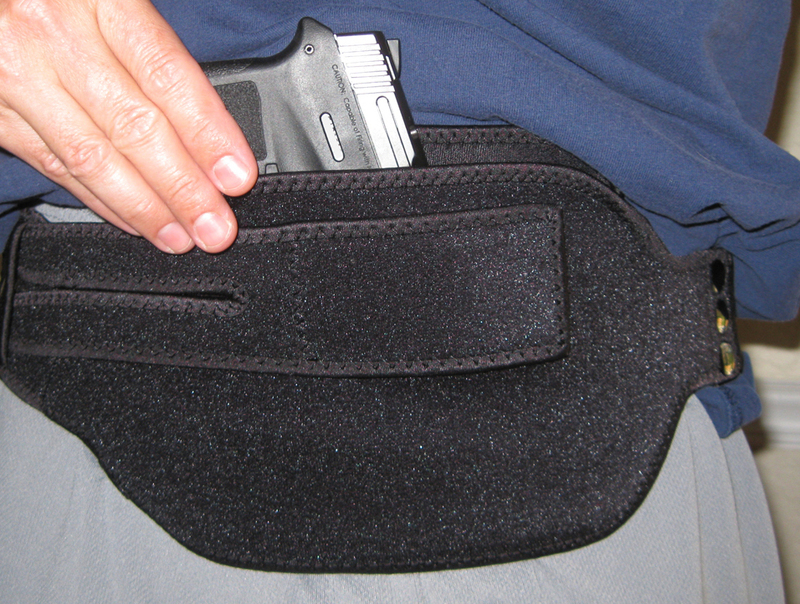 The holster gets a good grip on the pocket material and drawing the gun is not a problem. I have worn this gun in dress pants to dinner, the station, and court appearances (lockboxed in the main facility). Even with the thin material of dress pants and a dress belt, I find the gun pleasant to wear. I’m not a fan of ankle holsters and guns a bit larger than this “print” in slacks. 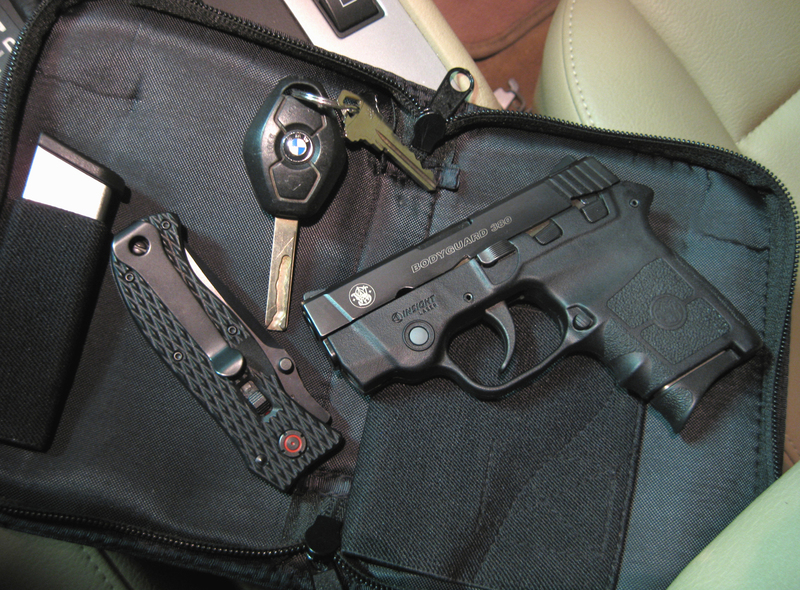 When driving my personal car, the Bodyguard rides in the Smith & Wesson-provided nylon “dayplanner” holster that came in the blue box. I won’t pocket carry when driving because you cannot access the gun while wearing a seatbelt. The nylon carrier is a welcome way to keep the gun accessible when I am in the car. By last September, I had about 400 rounds through the gun. These were 90 grain Speer Gold Dot Hollow Point, 95 grain Speer Lawman Total Metal Jacket, and 95 grain Fiocchi Full Metal Jacket. I have put an additional 250 rounds through the Bodyguard 380 and can add 70 grain Corbon Pow’RBall to the list of ignited ammo. Most of the last 250 rounds have been the Fiocchi, since it is easiest on my bank account. The gun has run without failures to feed, extract, or eject. LAPD has nixed the use of the built-in laser on their officers’ guns. They have also deleted the safety lever. I would have to agree with these changes. The laser’s activation buttons are stiff and somewhat difficult to cycle through, not a plus in CQB. I have no use for the small, hard to manipulate safety for the same reasoning. Being somewhat fickle when it comes to firearms, I will admit to having a rotation of off-duty carry guns, but I’m happy to report that the S&W Bodyguard 380 still solidly makes the roster. 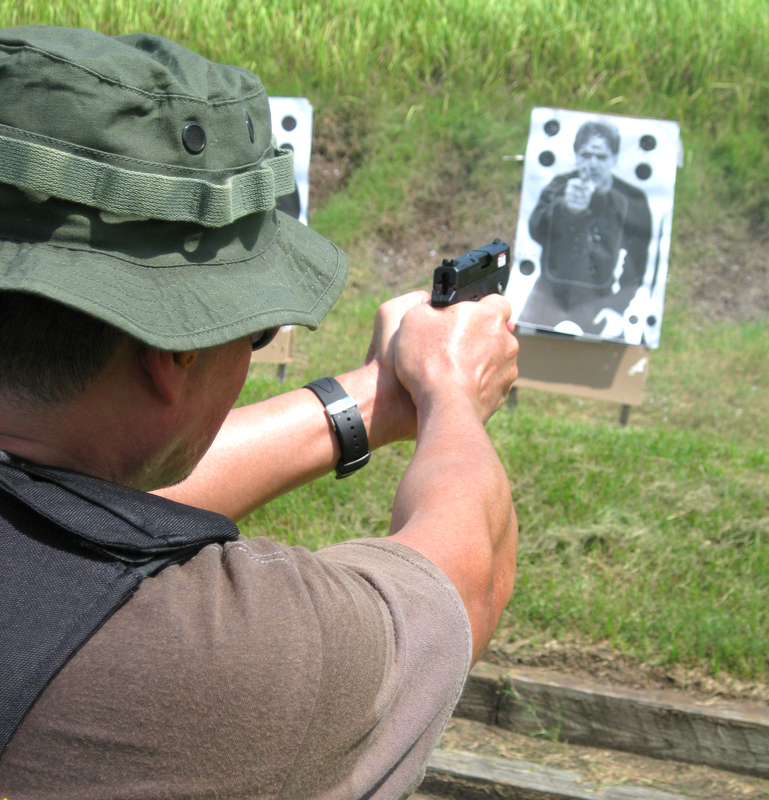 9/18/2012–Passed another required off-duty/secondary weapon qualification with the Bodyguard 380. It is the same state course we fire with our issued Sig Sauer P226’s. The Bodyguard has continued to function flawlessly. In addition to a spare S&W mag, I picked up a DeSantis Mag-Packer for the pocket reload. 5/24/2013–The batteries in my Insight laser finally gave out. Click here to find out what happened next! 1/5/2014–Smith & Wesson announces the new M&P Bodyguard 380. Read here. 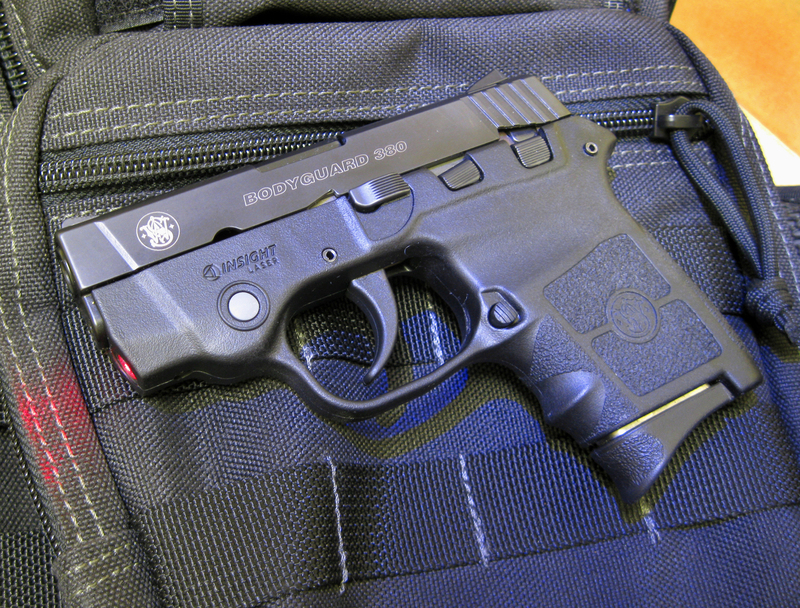 1/25/2014–Short video and article about shooting the M&P Bodyguard 380 at SHOT Show 2014 Media Day at the Range. Read here. 3/28/2015–New XS Express Front Tritium Sight on the BG 380. Read here. This entry was posted in Concealed Carry, Firearms, Off Duty and tagged .380 ACP, Bodyguard 380, Pistol, Review, Smith & Wesson, Update. Bookmark the permalink. Good to hear your experience with the BG has been good! While here in Venice I had an opportunity to shoot at an outdoor range. Pistol prformed perfectly. I’ve had good luck with my BG. The trigger pull is a bit heavy, but some like that on a carry pistol. Hey, range time is always too good and always too short! I have to agree with you on that trigger pull. I’m using the Bodyguard 380 as a BUG, so it does not bother me all that much – but it was definitely more then I expected. In my experience, it has been a very durable gun. I ankle carry it and it gets knocked around quite a bit. Also, no failures ever with about 500 rounds through it now. I’m glad they have more of these choices now in carry guns. When I first started about 10 years ago, there was not too many choices for BUG carry besides the snub nose revolver. Glock 26 got a bit too heavy after a few foot pursuits and the Kel Tec P3AT was never reliable for me to trust. I am also happy about all the choices in carry guns. I have both revolvers and pistols in my back-up/duty rotation. A Glock on my ankle in a foot pursuit makes me cringe. I think it would make me run in a giant circle! Hey, why am I back at the cruiser? Hahaha. l’m considering purchasing the Smith and Wesson Bodyguard 380. Is a good first gun for home protection? No, Paul, it is not. For home protection, I would go with a larger gun and larger caliber. A full-sized gun is easier to hold on to and learn to shoot. In addition, the full-sized handgun carries more ammunition and more potent ammunition. Concealment is not an issue for home protection and I know quite a few people who feel a shotgun or rifle is just fine. Sub compact guns are harder to shoot and take much practice, so I would never recommend one as a first gun. Nor as a home protection piece. Hey I just purchase a BG 380 4 weeks ago. I like the gun it shoots well. It is a good size. I have added Talon grips & XS Big Dot sights. Now the gun feels perfect. The XS sights make the difference. Before I got the gun I read about the flying takedown lever problem in some blogs from 2010. S&W said they fixed the problem. So I got the gun now the last time at the range the the lever flew out 4 times in 50 rounds. Have you heard anything about the fix. My gun is back at S&W now. Robert would you consider selling your bodyguard I could pay a little extra and u could buy a brand new one only asking because I live in CA and can’t buy it because I’m not LE ? See my post at the bottom. May have a BG 380, almost new, up for sale soon. A Calif. FFL will be required IF this is even legal there. I’m glad you wrote a review about his little wonder. I have been searching far and wide for a concealed weapon that would be carried. I am prior LE and favor a 1911 S & W but I also live in Florida and have the same problem as you with the heat and Summer clothes is kinda hard to conceal a 1911. I initially thought I would want the Keltek PF9 but didn’t like the plastic guide rod. I know that most plastic guns have the plastic guide rods now but I’m used to wheel guns and being made of metal and plastic guide rods just look like they could be snipped off with a pair of wire cutters. Anyway, I do like the Body Guard 380 and the safety could be a lot easier to take off and I wish the aser was momentary also instead of the on,pulse and off modes. I have fired about 100 rounds of Wally World Federal ball ammo and Hornady Critical Defense with no problems. I was suprised to hear that you had any at all. I don’t see the laser actually being used unless you were clearing a house and had time to activate, this is where the momentary switch would be good. The safety is nice if it makes you safer but in actualality it most likely will be carried in the ” off ” position because it is so hard to switch ” off “. I also wish it came with a spare mag, what the heck your gonna have to get a spare anyway so why not pack another opne with the package. I figure they don’t ship with a spare mag to save money but, your gonna get one anyway so it would be cheaper to pay for it in a package it seems to me. I really love this gun and the extra finger grove on the grip gives a good purchase compared to the other small pistols in this catagory. Thanks for your own update, Chris. I agree with your assessments of the safety and spare mag. I finally got off my wallet and bought a spare magazine. This one had the flat floorplate, so carry is a scad more versatile. The flat floorplate works better in my body armor, where the extended floorplate is just fine in the pants pocket. Is this gun rated for +P ammo? According to Smith & Wesson, +P can be used, but they caution about “more frequent service” required to the firearm. +P+ is not to be used in the Bodyguard 380. I downsized to the .380 as I no longer lived in Alaska: and wasn’t expecting anything of harm weighing more then 300lbs. After running 300+ rounds the trigger pull of 8+lbs has enlarger my right trigger finger to prevent easy penentration into nostril. When will a lighter spring be available? Dr. Flood, I don’t know of any plans for lighter springs. On the upside, you still have a back-up trigger finger on your left hand for emergency ingress into your proboscis. All of these comments and the review have been very helpful. Thanks! We’ve called them that for the 25 I’ve served. We don’t have black and whites in Florida. I enjoyed and very much appreciate your thoughts on the S&W 380. I have one as a CCW – mainly because of the reasons you set out – and it seems to fill the bill. The take down system is its weak link; the internal sppring snapped on mine. At another point the laser self destructed. S&W customer service was prompt and thoughtful, once I got them ‘broken in’. The initial response was rude and untimely and caused a letter to the CEO; suddenly everything happened like it should have. While I have good defense ammo, practice is everything to me and unlike some smaller handguns, this one is not picky about practice ammo and has eaten everything put on its plate, even the very cheapest stuff. Sorry there were some hiccups, but ultimately I hope you are pleased. Thanks for your comments! Well I purchased a S&W BG 380 and within a week with less than 100 rounds thru it the elevation screw for the laser fell out and then it got worse the firing pin broke. Mine is a high serial number made in Mar. of this year so what gives! The laser problem I can work with but a firing pin breaking since the introduction of this model! I like its feel and what is suppose to do but I now feel threatened by it! Sorry your experience has been negative, Norman. Hopefully, S&W CS will make it right. Well I got my BG back from Smith and clean it and was using snap caps thru it and guess what the firing pin broke again! Back to Smith for the 2nd time Hey 3 strikes and I want a refund!! Yeah, I think I’d be unhappy, too. I had a Kel Tec P-11 that I couldn’t get to run worth a s*%t. It went back to the maker, came back just as ornery. My buddy has nearly 1,000 rounds through his without a hiccup. Go figure. 3rd time and see if the firing pin holds up to the next 400 rounds! I do like the BG its options and ergonomics! I will go to the range and post back later! Well after getting it back after the first 2 broken firing pins, guess what the 3rd one broke with Tipton snap caps. so back it went againg for the 3rd time at least this time they will send me a new weapon!! Well with the first weapon I had 3 firing pins break so Smith sent me a new one! Guess what with Tipton Snapcaps after less than 100 trigger pulls the firing pin broke again in the same place!!! So back it goes, should I give up and ask for a refund or because I like the feel of it try again? Norman…You are either an idiot or a troll, so which one is it? Derek either one is fine by me as long as I am not you! Geez, guys. Let is rest. Thanks for excellent review and carry options for the bodyguard. I live in South Texas and face the same weather related carry mentioned in your review. I have not had one problem with the gun or any ammo related issues. The little gun eats up everything I’ve fed through it. Do you have any other recommendations for a good kydex CCW holster. I have been looking at Multiholsters and I like what I see. Brian K., I apologize for not answering sooner. I don’t have single kydex holster in the house, so I’m not much help. I live in Ga and always wear shorts. I carry they the bg.380 in a Desantis u7 holster. No one can tell I have it and it doesn’t slide around in my pocket. The laser helps when shooting at far away objects. I have had no issues with gun. I keep it cocked and loaded b/c trigger pull is too long. Always carry two clips. Would you consider the BG 380 a good option for a first weapon for CC? I will be spending quality time at the range before CC. Military veteran all I knew was M16 and grenades. If you understand the fundamentals of shooting and are willing to take the time to learn to handle a small gun like this well, then it can be a good choice. For many, these tiny pocket pistols are harder to shoot than a full-sized pistol or revolver. Sounds like your plan is on the right track, though. i just received my CC this year with a friends gun. Thanks for the review and comments. I will be purchasing this gun for my personal protection. see ya’ll on the range in S. FL !! Another couple of Central Floridians here. My wife bought a brand new BG 380 for CC especially when exiting her lab late at night. Within 2 weeks and about 300 rounds thru it, the laser screw backed out, preventing a slide return and a new round being chambered. Dealer sent it back to S&W but no word on turnaround time. Personally, I consider this gun unacceptable as far as reliability for self defense. I have loaned her my old “Baby” Glock 26 which she hates for weight but loves for ease of use, the trigger pull is smooth and consistent. She is going to wait for return from S&W and then give it a good workout (at Tenoroc outdoor range in Lakeland) before deciding whether it is junk or a keeper. ATTN: Daniel in above post……any transfers will have to be thru a CA FFL but hey, will keep you in mind! What the Catman describes was exactly my first failure with the BG 380; the broken takedown spring occured about the same time and was repaired at the same time. S&W then bent the head of the Allen screw to make it a ‘lift out’; this was good since the screw goes in at a strange angle. Then the laser failed; then the replacement laser failed. Three times back and forth to S&W but it is working after about 100 rounds. A good little weapon, but the devil is in the details and the details on this gun are, frankly, third rate. She also received her CCP in the mail, just a couple days shy of the 90 deadline, so she handed back my G26 and opted to carry her BG380. Neither of us has any time to visit range for an extended evaluation until Sat. or Sunday. Any more problems and this baby is history. Randel, great review no bs just facts. do you know if SW produced the bg 380 to meet the LAPD specs (no safety no laser) yet? If so maybe it will be made for the general public. what you think? thanks. My understanding from talks with Smith & Wesson reps was that the safety would be factory removed and filled. I recall the rep telling me that the lasers would stay and be deactivated by LAPD armorers. He said it didn’t make good business sense to redesign a whole frame around that small LAPD market. It was my understanding that the LAPD rendered the laser inop by removing the BATTERY! If they wanted a BU weapon without a safety, why not choose the Glock 26? The whole process does not address a fundamental flaw with this gun…..the laser set screw has been known to back out and prevent a round from chambering. Not great for reliability. 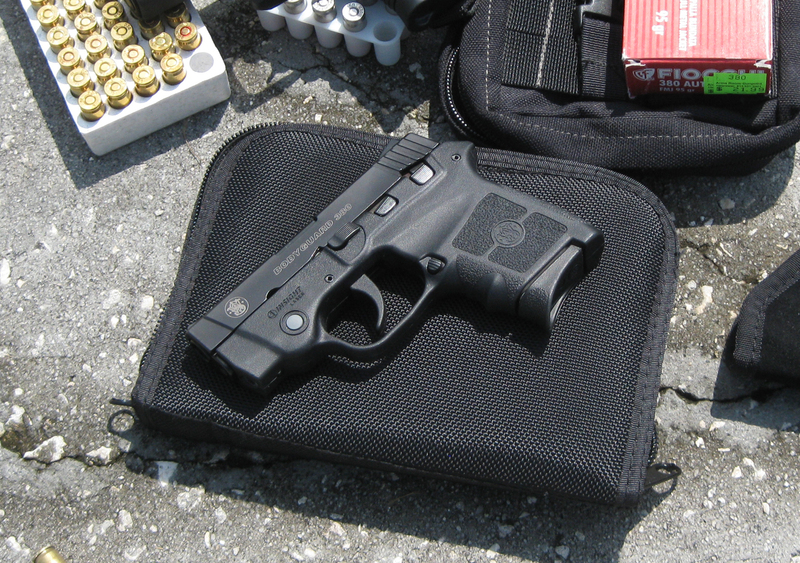 The Bodyguard 380 is not the only approved BU .380 ACP gun for LAPD, the Ruger LCP makes the cut, too. They may also carry other approved small handguns in .38 Spl, 9mm, .40 S&W, and .45 ACP. I saw your similar comment to the article I wrote for BlueSheepdog on the Bodyguard 380. I checked the set screw on my BG 380, but found it still in place. Thanks for the heads-up! I own a business that deals in mostly cash on a daily business. I live at the business so I am obviously here very late and very alone. Any recommendation as to what handgun I would want to carry, concealed? Is the S & W Bodyguard a good option? There are many great options out there. While my Bodyguard 380 has been a good little concealed carry pistol for me, there are many others. (In Florida, you may open carry a handgun in your place of business. This would allow you to move up into a larger gun and caliber.) If you were to stick with Smith & Wesson, the M&P line and new Shield have gotten very good reviews. Just off the top of my head, Glock, Kahr, and Springfield Armory XD are fine choices. It comes down to whether concealability trumps your sense of safety. If you are in a high threat area for robbery, considering your business, I’d up the caliber and go with at least a 9mm handgun. If you perceive the risk as low, and you are looking for a very small concealed gun that won’t be seen and scare your customers, then the Bodyguard 380 would fill the bill. Thank you for your reply. I am not in any type of crime area and my business does cater to a lot of families and small children so concealed is definitely the way I would want to go. I may look to get a second handgun that I can carry on me after my business closes and I am in the building alone. I appreciate your input. One caveat on the suitability of the BG 380: I am not a large man or have big hands but the BG 380 actually hurts my hand….it’s too small and the trigger does not fire until it is almost all the way back against the guard. Try it before you buy it, maybe at a range that allows rentals. I will do that! Thank you, very much. thanks for all the great info. I too have larger hands and would like your input on the BG380 extension grips, such as those made by garrison. Also, does the extended foot you see on bg magazines offered for sale help with this issue. Does anyone make a magazines that holds more bullets and therefore would be longer? 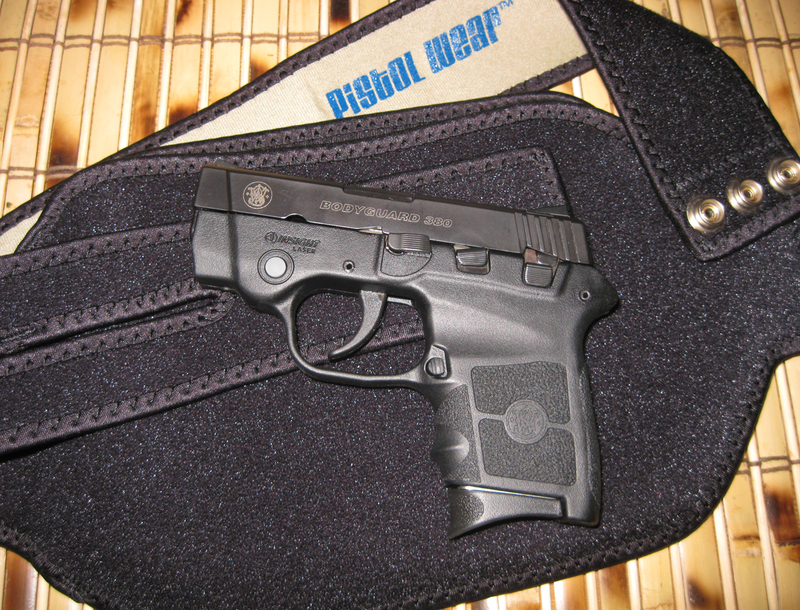 There are so many posts about the functionality of the smith and wesson Body Guard 380. I am in the process of purchasing my first gun and was wondering what are the best bigger caliber alternatives to this gun. While trying to keep to the same or as close as to the same size to this weapon as possible, can you advise? 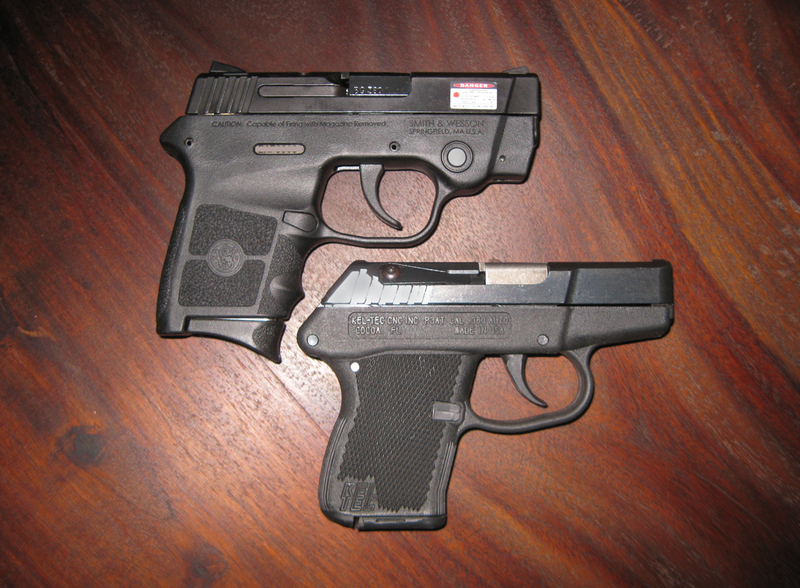 The closest you come to the small size of the Bodyguard 380 in larger caliber would be a small 9mm. There are many good ones from which to choose: Smith & Wesson Shield, Kahr PM9 or CM9, Ruger LC9, Kel-Tec PF9, Beretta Nano, and others. It is best to handle and shoot them before selecting one. Best of luck! Thanks for writing a complete review. I have purchased the BG. I am 74 and have two devices on my belt every day; a cell and a separate camera, so I don’t want another device on my hip. What is the best ankle holster for the BG with lazer? Another question is which is the best round to use for stopping power when using it for personal protection? There are many good ankle holsters on the market. I recently reviewed an Uncle Mike’s nylon one. You may look into one from Blue Stone products, that is a nicer version of the Uncle Mike’s–having a similar cinch strap and a more padded backing. Galco, Desantis, Bianchi, High Noon, and custom makers are out there, too. It will depend on the features and price point you have in mind. The only knock down round is the one you can shoot accurate. And if you are 74 and you can grab your ankle in a slpit second of an encounter. .I wish I could be in your shape. Would recommend the BG380 as a first gun? I am familiar with guns, but have never owned one. A retired law enforcement friend of mine say this gun has a reputation for becoming jammed. He doesn’t recommend it since I’m not a professional, I don’t want a jammed gun at the wrong time, what are your thoughts? Guess I should add that I’m female, 5’3″ average to heavy weight, smallish build (if you don’t count the extra weight), middle aged and active if any of that matters. 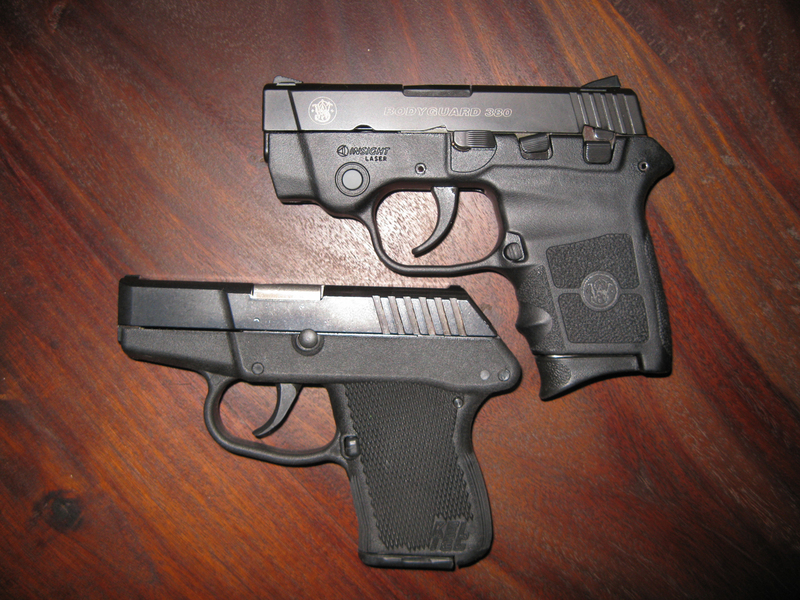 In my opinion, small .380’s are not ideal “first guns” because of their lack of grip size and short sight radius. If you were to consider one, head out to a local shooting range that rents guns and try them out. You may a find a subcompact is fine for you. Ruger’s new LC380 is the same compact size as their LC9, but has less recoil in the .380 round. There are many choices out there. My BG380 does not “jam,” but they are just machines after all. “Test driving” different ones will help you make a selection that’s right for you. Good luck and enjoy the search! I just picked up some low-cost 95 grain 380 Lead and FMJ to bring to the range. How many rounds can I put through the gun while at the range in one visit before needing a cleaning? If I understand your question, you should be able to get through a range session without cleaning until you get home. With the issues in th epress the past 6 months, I have become concerned and want to get into a better self-defense level. Have dusted off an old Taurus 38 Special revolver, that I bought new back in 1974, but never used. It shreds my trigger finger. Have been renting various pistols at the range and was considering the BG 380 for conceal carry. But at my experience level (maybe 500 rounds total), I need a different pistol. The first time I tried a pistol (2 months ago), I used a Baby Desert Eagle and a S&W MP both in 9 mm. The Baby Eagle felt great in terms of grip and less recoil. The S&W I would have rated good, but having just fired the Baby Desert Eagle, I put the S&W in 2nd place. When I compare the bullet size of a 38 special to a 9 mm, the 9 mm looks small. SO I was have tested 2 pistols at 40 S&W and 2 pistols at 45 S&W. I was surprise that the 40 cal pistols seems to have more recoil and were louder. I had hoped to settle on a caliber, get a large frame pistol to develop some level of skills, and then get a pocket pistol version For conceal/carry in the same caliber to keep things simple. Any suggestions? I agree with Randall – check out the line by Kahr Arms. with your choice and stay safe. A .38 caliber is pretty much the same DIAMETER as a 9mm. The difference is in the powder loads: .380 ACP has a lighter bullet and shorter casing with less powder. The .38 Special bullet is heavier, casing is longer and packs more powder (lookup +P and +P+ loads). The 9mm Luger: 9mmX19mm long, generally 115 – 125 gr. bullet and can have +P loads, is probably the cheapest per round because it is the most widely used ammo. So after returning my original S&W Bodyguard 380 3 times for a broken firing pin and having it returnered with it fixied! They sent me a new one I dry fired it with Tiption snapcaps and with less than 100 pulls on the trigger the same thing happened the firing pin broke same place same piece! Well back it goes again! Norman, either you got one hell of a strong trigger finger or those dang SnapCaps are just too much for such a little gun!!! Has anyone else had such a problem as this with this particular gun? My wife loves hers but is now on pins & needles waiting for something else to break before the warranty expires. All together, her gun has had maybe 6 or 8 hundred rounds thru it. Demand a refund under the “Lemon Law”. Does anyone have any Information about the SCCY CPX-2 GEN-2 9mm, I seen that people are recommending these for CCW. Any information would help, about the reliability of this pistol. I own a BG380 and highly recommend it, I’ve had no problems with mine. I’m looking to buy another gun and the SCCY’s are very low priced. Thank You! Tks. Fla Catman for the reply! On this model the broken firing pin is something that has occured! So I do like the S&W Bodyguard 380! problem I will continue to try and solve this problem! Why so much on the dry firing? I bought a small pkg. of A-Zoom snap caps for wife’s BG380. No problems at all, but nothing replaces a day at the range with some light loads, in the 90 gr. range, to get all the moving parts smoothed out. My original G26 tended to jam up with some JHP rounds on initial slide release. Gunsmith pointed out that it was best to let the gun work the way it was designed and not “baby” the loading sequence. Now I throw a full mag in and release the slide lock (which makes a very reassuring thunk) and all is well! We will be going back to an indoor range on Thursday to try out some other types (Governor and Judge) but will fire at least 100 rounds thru BG380 and G26……then clean both guns, taking care not to leave excess CLP or Rem oil anywhere near the firing pin mechanism. Wife & I went to indoor range today to try out the S&W Governor. Started out with rimmed 45 Colt (?) so no moon clips. Bullet weight was 224 gr., almost twice the weight of my 9mm and way more than the 90 grain of wife’s BG380 load. After firing a bunch of those, I moved to 410 shotgun with 000 pellets. The buck and kick was way less than I anticipated, really bearable but steady, no jump. The gun is heavy so that helps. After we both shot the Gov. firing her BG380 was like a pop gun and even my Glock 26 was a pussycat. She has become very proficient with the Bodyguard even at 15+ yards but her hand gets sore after a box of ammo. After the initial trip back to S&W, the BG380 has performed flawlessly, I even examine the laser set screw just to make sure its tight. So far, so good! surfaces added a Lasermax recoil laser and a ported Storm Lake barrel. It has never had a problem! fluff and buff and never had a problem! screw fell out and the firing pin broke! pull and I feel it works except that the firing pin broke again on the second BG! What a great forum. Thanks to so many for such wonderful information. I work on the road in a new city each week and do not know a lot about where I am going before I get there. A week ago I found myself in a very bad section of Columbus, OH. Sometimes my GPS takes my through bad sections which are not always safe. I have a Glock 31 which fires .357 sig rounds and I love them. I have a Glock 26 which fires 9mm rounds and with the X-Grip it makes the small grip full sized and I find that it has improved my accuracy but that gun even without the X-Grip is too large for effective conceal carry. About a week ago I bought a S&W Bodyguard 380 and in the Cleveland area took it to the range for my first shooting experience with it. Here are my observations. 1 – The trigger pull seems to be very long but during the first clip I was able to adjust to it. I fired at a few rounds at 7 yards then moved it to 10 yards and only using the laser sight I found it to be very accurate. 2 – I loaded the second clip and only using the laser sight hit the bullseye in 5 of 6 rounds. The 6th round was less than 2 inches from the bullseye. 3 – I loaded the 3rd clip and fired 5 of 6 shots to the head from 10 yards. I was very pleased. A gentlemen was in the lane next to me shooting the same model and not using the laser sight was far less accurate on the identical target. In summary, I so far have fired only 18 shots total so I cannot speak in terms of durability but love what I’ve experienced upo to now. I did load up my Glock 26 and fired 2, 15 round magazines using my X-Grips and was warned that I was firing faster than rules allow. I went through the 1st clip in about 10 seconds, hitting the body cavity on 13 of 15 rounds. I then loaded the 2nd 15 round clip and had a much smaller pattern and wrapped up for the evening. I love my 3 firearms and find a specific time for each. Again, thanks for the great information. I have been carrying ever since my state passed CCW laws. I live in NC, so it’s warm more than cold, so my first choice in CC is usually a too bulky for what you wear when it’s warm (hot). I went into local gun shop a few weeks back and the clerk told me they had just gotten a Bodyguard .380 in. I fiddled with it and decided to give it a spin. I got to shoot it this past weekend and put about 100 rounds through it. No FTF’s, or anything. Tried three different ammos in it and all fed flawlessly. Since I had .380’s with me, I was shooting my stainless PPK/S alongside. Smith was WAY more reliable. Yes, trigger is tough. But after three mags, i could keep it in the circle without any problem. I wouldn’t recommend this gun as your first piece, but if you have experience with firearms and can practice, it’s concealability is great! I carry mine in a Stoner leather 3-way clip. 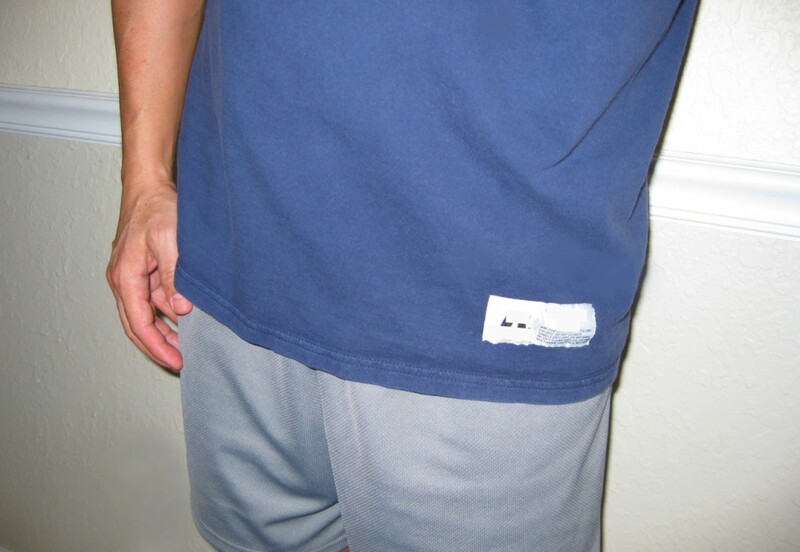 shirt tail out, it makes no bulge, and if it does, it’s the size of a cell phone. Thanks for your review! You are very thorough and fair! Randall, I have a line on a NIB .380 Bodyguard minus the laser for $305.00 out the door. Have never carried a .380 off duty but am looking for something small to replace my Glock 23 (off duty). Curious to know what you think? Good price? Still consider it a good off duty? I think that is a great price. If you buy it, give it 400-500 rounds of break-in until you carry it for SD. I am very happy with mine. I have many rounds through it and many miles on it without a problem. Mine digests Speer GDHP’s as its main diet. Yours may like other ammo. Hope it works out for you. I have owned my .380 for three years and have run well over 600 rounds. I had hoped the finger pull would loosen. Unfortunately, It still remains tight…To my knowledge there is still no alt springs available. I agree Randall I saw the post and replied as polite as possible! I recently purchased 380 BG and have shot it at the range with the laser and wo. For just learning to shoot, I was able to hit the target almost every time. I did find that the trigger pull is a little hard for me than the Glock 40, but I just used my other hand as well so I could hold it steady. It definitely packs a punch,more so than the Glock 40…. Ashley, the Bodyguard 380 has a hammer-firing double action trigger pull that is intended to be a bit heavy for safety. Glock uses a striker-fired Safe-action trigger that is more like a single action with a lighter pull. Different designs with different goals. Glad you shoot the BG well! Randall, I’m just curious, is there a grip I can add to the existing grip to make it thicker. I know I can get an extender to make the handle longer. Ashley, if you search the Internet for “handgun grip sleeves,” you will find a few options. Pachmayr makes one that is pretty popular. Some of the generic ones for a Ruger LCP or Kel-Tec P3AT will fit, but I would stick with one specifically made for the Bodyguard 380. Happy hunting! Sorry your experience has not been satisfactory, but many are happy with theirs. As far as complaints, I can think of quite a few guns that draw the ire of forumites. Latest on the BG380. Dealer sent it back to S^W. I hope they can fix it because I really like this gun and I have a Shield that hasn’t missed a round , no light strikes FTFs, FTE, etc in over 400 rounds. I;ll post results once I get it back. Thanks, Stephen. Keep us apprised! Looking for a very clean BG 380 package? My wife traded up so we are an all 9mm family. Latest on my BG 380. Still firing on every pull. No fte, ftf , light strikes, alwaysd fires, any ammo. But, like others on this thread, the crimson trace laser stopped working. I replaced the batteries, still NG. Called S&W and they had me send the laser (only) back to them. Waiting for a replacement, no charge. Very impressed with their service. Seems like a bit of a backlog with these. Hopefully the new laser will last. Got it back yesterday, installed it and it works fine now. Good to hear, Steve. Fully functional once more!